Georgia O'Keeffe is one of America's best-known female artists whose distinctive, colorful works and powerful abstract images are timeless and memorable. Although a child of the mid-west, Georgia O'Keeffe's amazing talents and drive set her on a journey that brought her to the shores of Lake George regularly during the 1920's, where she memorialized her surroundings in exquisite color and impressions. 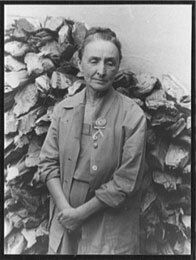 Georgia Totto O'Keeffe was born the second of seven children on November 15, 1887 near Sun Prairie, Wisconsin. O'Keeffe grew up on a farm and received her first art lessons at home. At school, O'Keeffe's teachers provided further encouragement for her to pursue a career as an artist. Upon graduating from high school in 1905, O'Keeffe officially entered the art world. From 1905-1906, O'Keeffe attended the Art Institute of Chicago, and then from 1907-1908, she traveled to the Northeast to study at the Art Students League in New York City. Her studies mainly focused on the techniques of traditional realist painting. In 1908, she was awarded a scholarship from the Art Students League that gave O'Keeffe the opportunity to attend a summer retreat in Lake George. This was O'Keeffe's first introduction to the Lake George region. Although O'Keeffe was heavily influenced by realism early in her career, she soon began to develop her distinct modernist style. During a summer course taught by Alon Bement in 1912, she learned about the revolutionary ideas of Arthur Wesley Dow, who provided an alternative to realism. 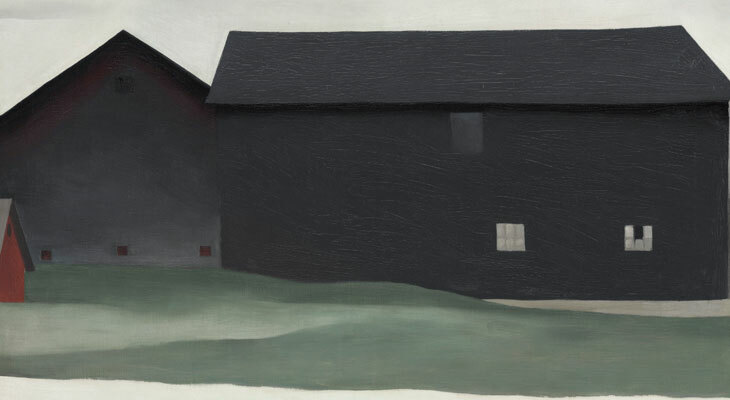 Rather than replicate reality, Dow's style of art emphasized personal expression through composition and design. O'Keeffe took these teachings to heart and soon delved more into abstract and modernist, rather than realist, art. Her art became a way to express ideas and feelings, and in 1915, she created a series of abstract charcoal drawings that broke tradition and made her a pioneering American modernist. Upon completion, she sent some of these drawings to a friend in New York City, who then showed them to well-known art dealer and photographer Alfred Stieglitz. In 1916, Stieglitz became the first person to exhibit O'Keeffe's work as part of an exhibition in his avant-garde gallery. Two years later, Stieglitz invited O'Keeffe to New York City to paint for a year in exchange for financial support. From there, their relationship grew, and they eventually married in 1924. From 1918-1934, Georgia O'Keeffe spent part of every year - mostly extended summers - at Alfred Stieglitz's family estate, located just north of Lake George Village. During this time, she based many of her groundbreaking works and paintings on the area around the Lake George estate. Indeed, O'Keeffe's paintings were commonly inspired by different places and her surroundings. Her Lake George works represented an abstract and modernist take on panoramic views of the lake, mountains, and close-ups of trees, flowers, barns, and more. For example, her paintings of large flowers were less realistic and more symbolic, and some critics have even described them as sensual based on their design. Over the years, O'Keeffe worked in her Lake George studio and created over 200 paintings on canvas and paper, as well as sketches and pastels. Many of her works were exhibited in New York City to much acclaim, and she was one of America's most successful artists. This period is considered the most prolific of her entire career. Despite her success in Lake George, life in the region wasn't the easiest for O'Keeffe. While Stieglitz enjoyed hosting guests, O'Keeffe preferred the privacy of her work studio. By 1930, the two had become distant, and O'Keeffe began to take trips to New Mexico to work. The indigenous art and adobe architecture gave her a new sense of inspiration. When Stieglitz died in 1946, O'Keeffe traveled to Lake George one more time to bury his ashes beneath a tall pine tree beside the shore. O'Keeffe then went back to New Mexico and made it her permanent residence. She traveled around the world in the 1950s, and art remained a part of O'Keeffe's life until she passed away in 1986 at the age of 98. Today, O'Keeffe is considered one of the most iconic and important artists of the early American modernist era. The places she visited certainly inspired her paintings, from New York City and New Mexico, to Lake George and Peru, and O'Keeffe's diverse and profound works of art have had a lasting impact throughout the world.